The above is also quite a ridiculous title for a post but it couldn’t be helped considering tis subject: a whale accessory called Wooden Zoo. It also works for the iPod 4G. Seen below is the I.dear in all its glory. Of course, it’s made in South Korea, where an endless variety of electronics trinkets and little toys are the lifeblood of its own unique consumer culture. But the I.dear has its own secret that isn’t apparent upon first glance. What’s the secret? 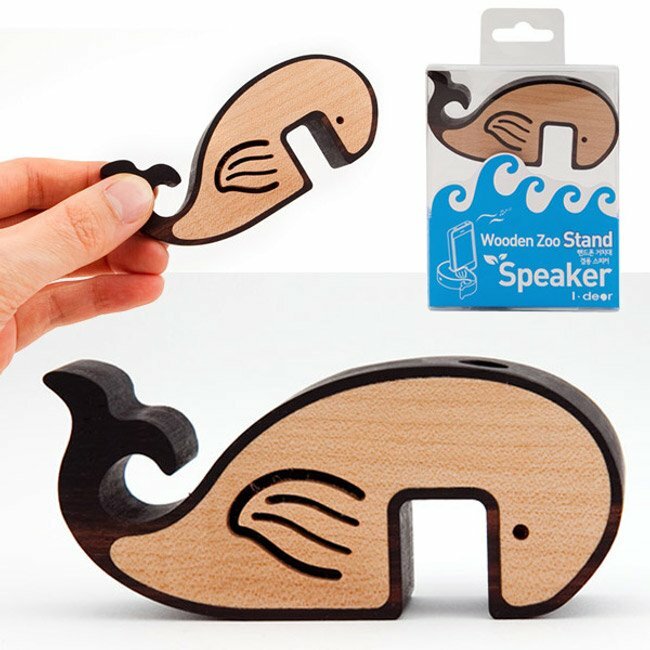 The I.dear Wooden Zoo stand works by clamping the whale’s gaping mouth onto the edge of a willing iPhone. Once it’s in place, the iPhone can now stand tall and proud. The big surprise comes from the speaker—it has a speaker! The speaker functionality goes live through a 3.5mm audio jack that connects where the whale’s blowhole should be. So two devices for in one gaping baleen. Hah! For the record we have no idea why this is called I.dear or Wooden Zoo. Maybe there’s an entire series of these animal shaped iPhone accessories.